For fabulous coloured lighting effects Led-Zip have this RGB flexible led strip. 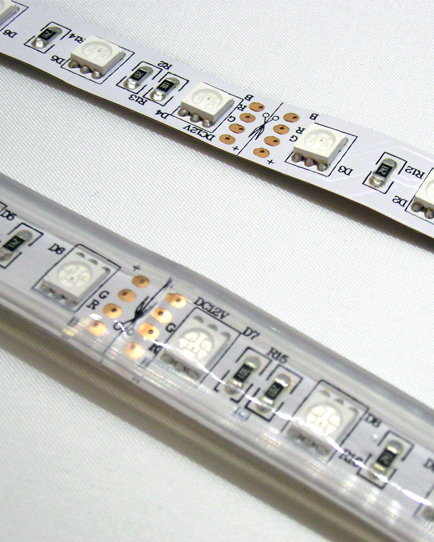 The strip light has 60 5050 RGB LEDs per metre, this gives a maximum power of 15w/m when set to white (all LEDs on). This strip also has connection/cutting points every 50mm. Available in an IP65 waterproof version using a crystal clear polyurethane coating and both versions have a high quality 3M adhesive on the rear face. RGB flexible led strip is supplied on 5m reels but smaller lengths can be cut to order, please contact the office for details.